75 Types of Wood Ranked by Janka Hardness and How They Are Used #infographic ~ Visualistan '+g+"
Wood comes in many different sizes, colors, and strengths depending on the tree that it comes from. While size and color can be observed, the strength of a tree’s wood needs to be tested. This is called the Janka hardness test, which measures how resistant wood is to denting and wear as well as measures the force that is required to embed steel into it. 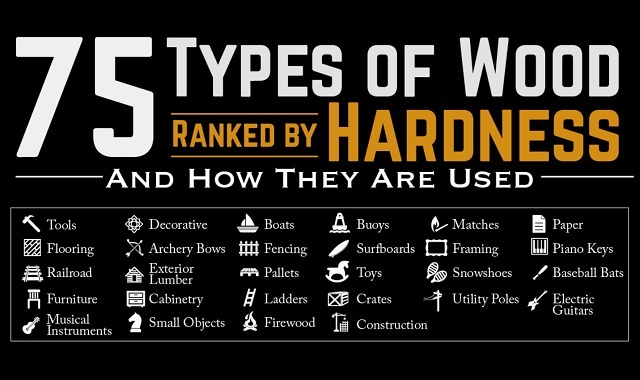 This infographic from Alan's Factory Outlet compares the Janka hardness between 75 different types of wood, as well as suggestions on the best way to use each type of wood. These suggestions span a wide variety of uses for the wood such as tools, flooring, musical instruments, and even the best choices for firewood. Did you know that there are 16 different types of wood that are used in instruments? The hardness of the different woods helps to produce a variety of sounds. This guide from AlansFactoryOutlet.com is great for anyone just getting started in woodworking, or even just trying their hand at some remodeling projects around the house!